We do not grow many Southern hemisphere bulbs as they mostly prefer better conditions than we can offer them but every so often we find one that is happy. I was given a plant of Moraea alpina some years ago and it has steadily increased producing its beautiful flowers, under glass, in June. You have to be quick as the flowers only last a few hours they open in the morning and have withered by late afternoon. They do produce a succession of blooms, about five per stem, opening one after the other, separated by a day or so depending on the weather. 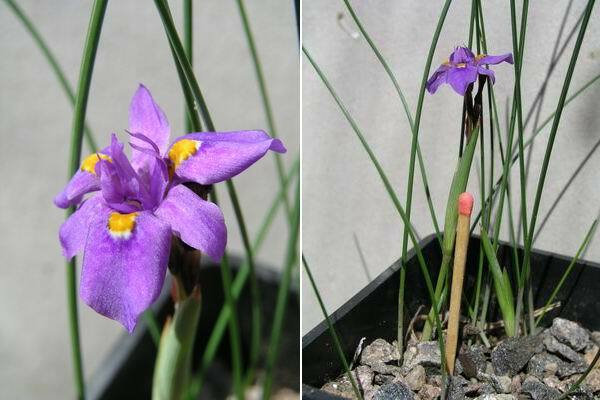 The other reason it is easy to miss the flowering is that they are tiny - here I have a normal match stick beside the plant to give a comparison of the scale. 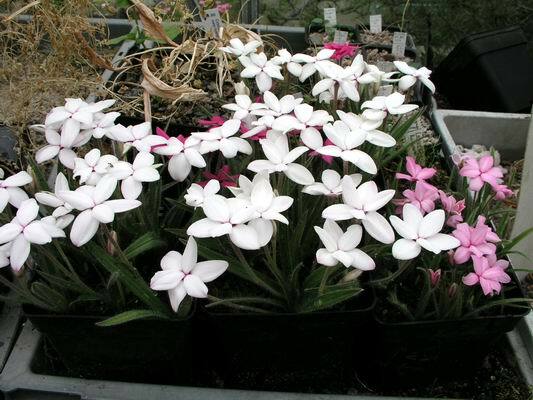 We are also very successful with another South African bulb; the Rhodohypoxis are just coming into flower and these are a few of my selected seedlings. They are such prolific little flowers that produce bloom after bloom all through the months of June, July and August and they are so cheerful with their bright colours. My favourites are the large white ones and the dark red ones. - These are the ones that I am selecting but they are shown off best when grown along with the pink ones so we must grow them all. 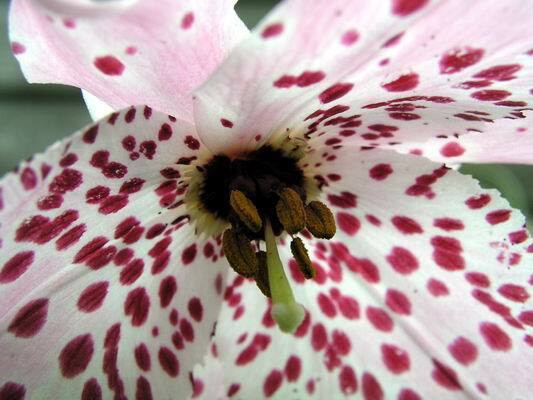 Note that you can just see the anthers peeking shyly out from the centre of the petals of the white one and also you will see that there are small hairs on the petal tips, best seen on the red one, a feature common to so many bulbs. Staying in the Southern Hemisphere the Oxalis are starting to flower as well. 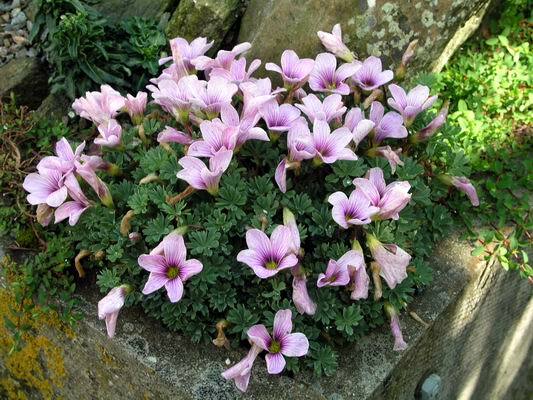 The hybrid between O. laciniata and enneaphylla, Oxalis 'Ione Hecker' is one of the best and has stood the test of time. We have grown it for close to thirty years from a single source and we have plenty of it around and we have distributed hundreds of plants over the years. Two of Harold Mcbride's seedlings that he gave us many years ago are also happy growing outside in a trough where they are increasing steadily. 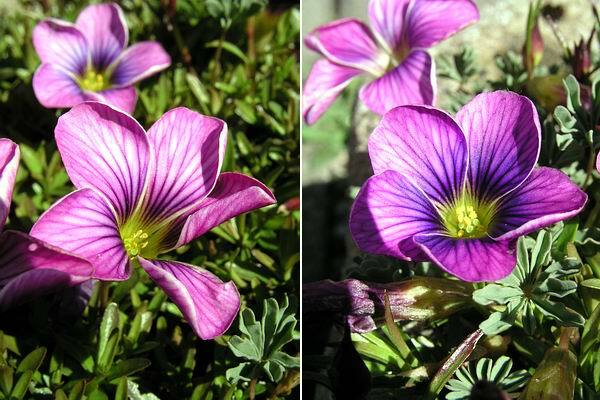 I think the one on the the right is now named Oxalis 'Gwen McBride'. 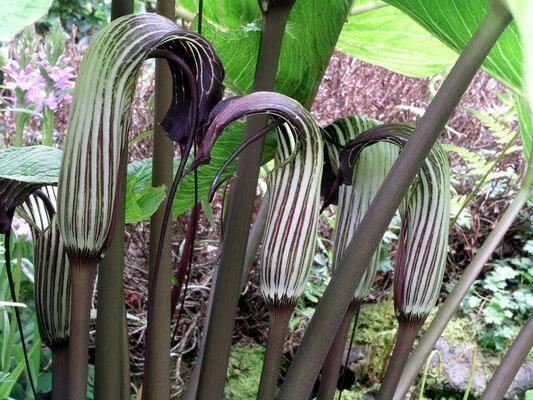 This is a very stately Arisaema which increases year on year producing more of these fantastic flowers. 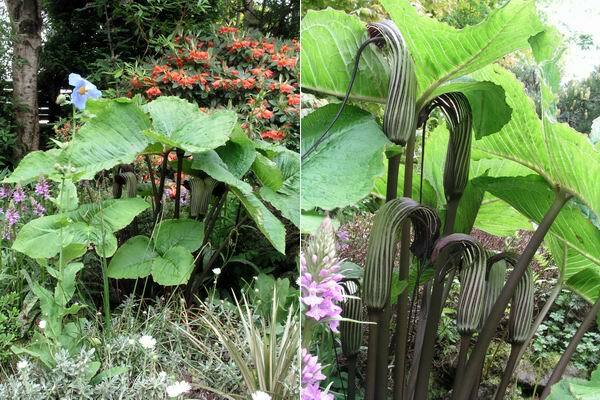 If any of our Arisaema experts can confirm the name of it I would be very pleased, perhaps I should buy the book. I am sure that it is in the same group as A. griffithii as it has some similarities and A. wilsoni has been suggested - answers to the forum please. To give you an idea of the scale here is a complete view of the plant. You can see it is large and as the season progresses the leaves extend to the size of rhubarb leaves - not a plant for a small rock garden. The seed head of Muscari macrocarpum shows clearly the remains of the sterile flowers at the top of the spike and the very large inflated seed pods, which give it its name, below. 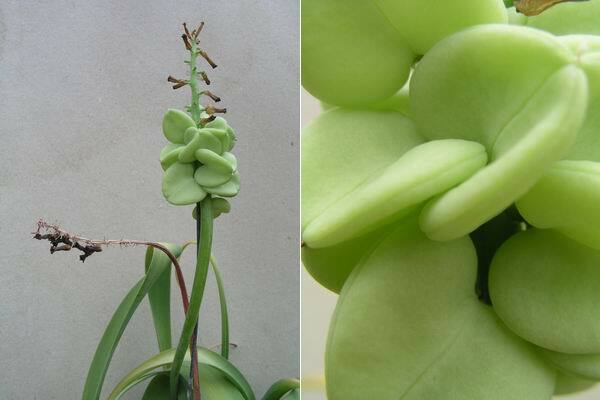 They are very sculptural and green and they are produced most years, unfortunately they are not often full of seed. 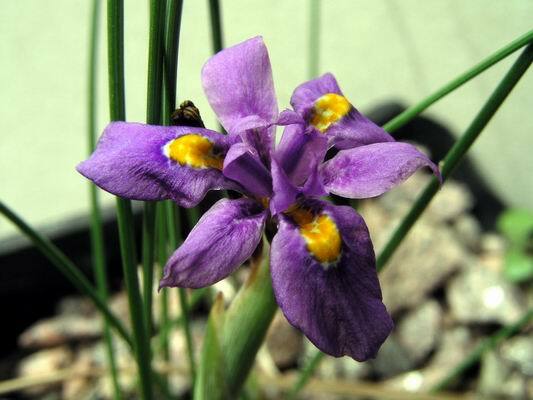 Some bulbs go through this process of producing a nice fat seed pod even if they have no seed while on others the unfertile seed pod withers with the flower. While checking a frame I found a nasty surprise in a pot of seed raised Fritillaria camschatensis. 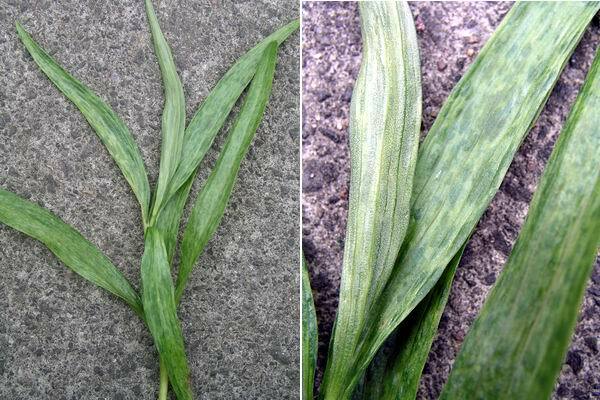 This checkering on the leaves is, I am sure, a sign of a virus infection. Viruses are ever present and we have to be vigilant as gardeners to minimise the risk to our plants from this incurable condition. This mottling in the colour is an early symptom of the disease by next year this plant will start to show signs of distorted foliage and it will slowly die. This picture was taken as the plant was on the way to being destroyed. We must keep our collections as clear of virus as we can by ruthlessly destroying any plants that we suspect of being infected by a virus before it spreads. I was horrified to watch what looked like virus-infected Dactylorizas being planted on a national TV gardening program last week - they should be setting a better example than that. 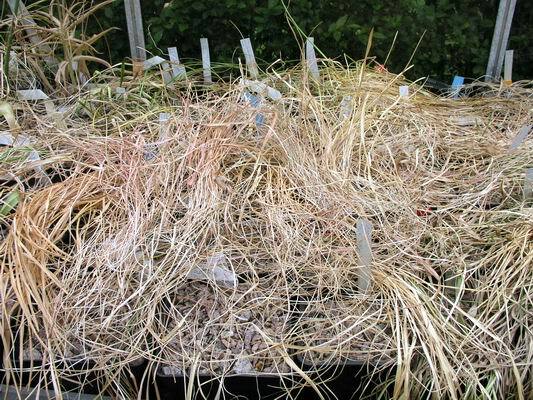 In the bulb house it is like a hay field as most signs of green have gone. This is a critical time for bulbs as they slip into their dormant rest and we must be very careful that they are not too wet or they may suffer rot. From experience and observation you will know the signs that the moisture level in the pot is low enough, if you are in any doubt then it is better to tip it out and have a look. I had one pot of Sternbergia that I felt was a bit too wet so I tipped it out spread it on a tray in the sun for a few hours, with the bulbs on top of the compost, which allowed the surplus moisture to evaporate then I put it back into the pot roughly - it will now be fine until I repot it in July. If I had not done this some or all of the bulbs would have been at risk from basal plate rot, which is fatal. 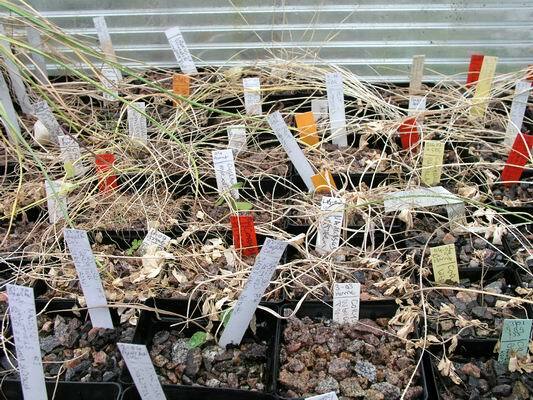 At the other extreme these pots of young seedling bulbs do not want to get completely arid - the tiny bulbs do have not sufficient reserve to take them through a prolonged hot dry period. I quickly run the spray from the hose over them, just misting the gravel, this is enough to stop the tiny seedling being desiccated. It is a juggling act: too wet and they can suffer rot, too dry and the smaller bulbs will suffer and every year the weather changes bring different conditions to the season. To go out on a cheery note, the first of the Nomocharis are just opening.